When someone says ‘A musical about the life of J.R.R Tolkien’ you think to yourself ‘Why?’ Yet after reading about his life you’d understand this subject matter is perfect for a musical. Tolkien’s life is littered with drama from the passing of his mother at an early age through to The Battle of the Somme where he contracted trench fever and then to his coup de grace when he published the Lord of the Rings trilogy; and turning this into a musical is the job of young composter Joseph Purdue and book writer Claire Gibson, and what a task it is. As the performance starts we’re introduced to the fact this is a semi-staged version and only features the songs. It’s directed by Adam Haigh and he has done an exquisite job of staging at the Stockwell Playhouse. The use of a minimalist set and a constant ensemble presence on stage is very effective. 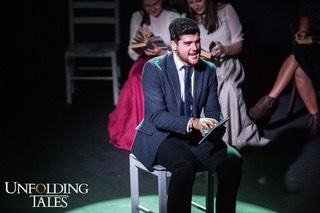 Unfolding Tales is led by Liam Doyle who brings a delicacy and power to the part that is quite lovely to listen to. Accompanying Liam is Alexa Terry as Tolkien’s wife Edith Bratt. Her performance was so natural, raw and the vulnerable. This is a masterful performance and a real lesson in musical theatre. Her vocals make an easy time of the demanding songs written for the part, stretching over her whole vocal range (and then some) without sounding strained or difficult. Bravo! 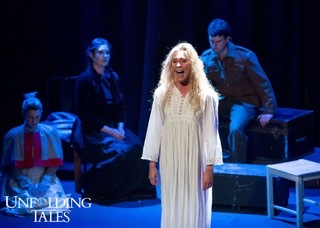 Singing the part of Tolkien’s Mother is Jodie Steele. A vocal powerhouse let loose amongst south west London. Her vocals give a great depth to the piece. Every musical has a heart. In ‘A Chorus Line’ ‘At the Ballet’ is the heart: in Unfolding Tales there is a duet between Tolkien and his Mother called ’Still So Close’ in the second act and this is, quite clearly the heart. It’s an absolutely beautiful song in which Doyle and Steele’s voice meld wonderfully, bringing the ghostly atmosphere to life. Special mentions to Graham Foote and Giuseppe Pellingra for some excellent signing. Graham Soars above the cast with his beautiful tenor and Giuseppe grounds them with his Bass lower notes that vibrate through your soul. the nuances of the score falling with every diminuendo and raising with force with every crescendo. Delicate and accurate with harmonies then when you’re not expecting it the music and vocals hit you like an emotional truck in unison. The music from Unfolding Tales is phenomenal and stirring. 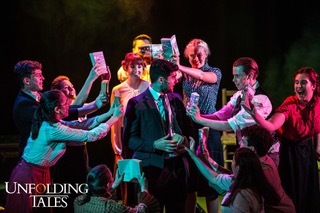 We are so thirsty for new musical theatre and this, musically ticks the boxes. It would be interesting to see this as a full production. Keep an eye out for Unfolding Tales as I’m sure this isn’t the last we will be seeing of the work of Joseph Purdue.